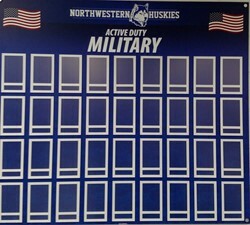 In an effort to recognize and show honor to our Northwestern Alumni that are Active Duty Military we have secured a display board. This has been a collaboration between the American Legion, The Northwestern Ruritan Club and Northwestern Local Schools. While it is not feasible for us to maintain a display board for all veterans, we do feel that we can maintain an accurate display board for Alumni of the Northwestern Local School District who are active duty Military. We will need a 4’ x 6” picture of the individual, in uniform. We will create a label that notes the individual’s name and the military branch. This display board is inclusive of all branches of the Military. If you have a son or daughter in the Military and can get a picture to us, along with the associated information, we will get it on the board. You can also forward this to them and they can deal directly with us. Please feel free to forward this to someone that fits the criteria for this recognition. We feel this is a very unique project and are proud to have this opportunity. Thank you to all who have supported the project and have allowed the idea to move into a reality.